This weeks kicks off some great Reiki circles. They are community gatherings of practitioners, teachers and are open to the interested public to give and receiving in healing light and energy. Tuesday, 7/17 from 6:30-8:30pm we’ll be in the lovely open space of Dreamclinic, 902 NE 65th Ave NE. $10 donation suggested. Bring your friends and family and leave revitalized and renewed! Wednesday, 7/18 from 7-8:30pm we’ll be over in West Seattle at the Highland Park Improvement Club giving a brief overview on what Reiki is and the jumping into the healing circle. This group ope to families with kids! Donation. Hope to see you at one or both! Let that light shine!! 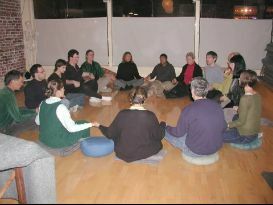 Photo of our Reiki circle from Reiki Soundscape circa 2004 in Ballard! Hi! I have my level 2 attunement and the group I’m with wants to have a Reiki share every week. I like the circle idea in your image above, but what exactly are you doing with all hands touching? Focusing on anything specific like a chakra, or letting the Reiki flow through your hands into everyone else?